2. If the victims had been carrying guns, they would have been able to prevent the multiple shooting. 3. If gun ownership were restricted, then only “bad guys” would have guns and the “good guys” would be helpless to defend themselves. 4. The mere knowledge that “good guys” have guns prevents “bad guys” from committing mass shootings. All four claims are deficient in that they misdirect us from the real problem. A push for tighter gun laws in the US has once again taken center stage in the wake of a 26-year-old man opening fire on Umpqua Community College in Roseburg, Oregon, and killing 10 people. The suspected shooter, Chris Mercer, carried with him three pistols, a rifle, and five extra magazines — all legally obtained. By strange “coincidence,” the U.S. has more guns per capita than any other nation on earth — nearly double the next highest country, Serbia. We are the only nation on earth with more guns than people. America’s #1 gun myth is: Widespread gun ownership reduces gun killings and makes American’s safer. In 1996, a man named Martin Bryant became the worst killer in Australia’s history. After walking into a cafe in Port Arthur, Tasmania, he killed 35 people and wounded 23 others with a semiautomatic rifle and another semiautomatic assault weapon. 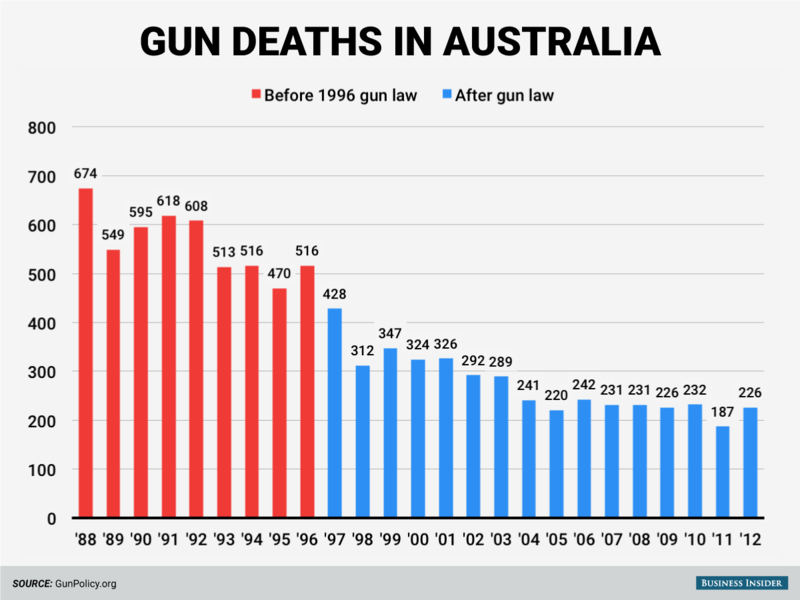 As a result, Australia enacted one of the largest gun reforms in recent history — and gun deaths plummeted. The changes remain the gold standard for advocates of gun control today. Note the difference? In America, whenever we have a mass shooting, the the gun manufacturersand their paid stooge, the NRA, call for more guns. Australia did the opposite. Australia gives its national government only limited powers. So Prime Minister John Howard challenged the country’s various states to support nationwide reform while the national government banned the import of specific weapons. For a while, some states seemed unwilling to pass the reform. Just as would happen in America. Howard, however, made clear his government would counter with a referendum to alter Australia’s Constitution and give itself the power to regulate guns. “The fundamental problem was the ready availability of high-powered weapons, which enabled people to convert their murderous impulses into mass killing. These reforms passed, creating the National Firearms Agreement. Aside from banning certain semiautomatic and self-loading rifles and shotguns, the legislation required all firearm-license applicants to show “genuine reason” for owning a gun, which couldn’t include self-defense. Aside from the NFA, Australia still had to remove the guns then on its streets and instituted a mandatory, federally financed gun-buyback program. Australia’s government purchased nearly 700,000 guns. Percentage-wise, that’s the equivalent of 40 million in the US. Actually, America would have to buy back more than 40 million guns. Australia currently has 22 guns per 100 people. The U.S. has an astounding 113 guns per 100 people, a difference of 91 guns for every 100 people. To get down to Australia’s level, the U.S government would have to buy back about 300 million guns. That is how swamped with guns America is. Researchers from two different Australian universities found that, in the decade after the NFA was introduced, the firearm homicide rate fell by 59% and the firearm suicide rate fell by 65% — without increases in other types of deaths. Among the reasons stands the shining fact that Australia hasn’t experienced a massacre similar to Port Arthur since. Many studies do show a drop outside expected trends in gun deaths as well. And of those that have found the opposite, many have been discredited. Research shows a strong correlation between the amount of guns and the amount of gun homicides — on a national, state, and personal level. While one logically may expect that reducing the number of guns reduces the number of gun killings, logic sorely has been missing in the U.S. gun debate. For too many Americans, the love of guns and the fear of others who have guns, is like a religious experience that transcends all logic. Howard acknowledge Australia’s difference from the US: A more urban society, nothing similar to the US Second Amendment, and no organization like the National Rifle Association. Donald Trump and the rest of the Republican Party has misdirected our fears toward terrorism, while saying nothing — absolutely nothing — about the dangers of guns. It like the misdirection of a magician, who makes you focus on one thing, while fooling you about the real thing. In fact, the odds of being killed by a terrorist are much, much lower than the odds of your winning Spain’s Sorteo Extraordinario de Navidad (Spanish Christmas Lottery), the world’s largest lottery — whether you enter or not. Here are the figures for 2004 through 2014: U.S. terrorism deaths: 295. U.S. gun deaths: 127,562. 1. Australia has proved that fewer guns results in fewer gun killings. Guns in the general population do not make us safer. 2. A policy based on “good guys having guns protects us” is a myth, promulgated by the arms industry to sell guns and increase profits. 3. There is no logical reason why the U.S. doesn’t follow Australia’s lead in reducing gun deaths. Rather than spending your money to buy a gun, while allowing everyone else to own a gun, you should spend the same money to buy a ticket in the Sorteo Extraordinario de Navidad. Your odds of living a long, happy, healthy life would be better. Recessions come only after the blue line drops below zero. America is a land where average people shoot each other while rich people enjoy the bloodbath from their lofty penthouses and fortified mansions. Gun-nuts often say that “an armed society is a police society.” They mean that if everyone is armed, then no one can commit violence. There are many problems with this viewpoint, one of them being that the reverse can also be true: when everyone is armed, no one can avoid violence. One thing is certain: with so many guns in society, the police assume that every motorist is armed and dangerous. And everyone will believe the police when they lay a “drop weapon” near you and claim that you had a gun. Indeed, these days, if a policeman approaches you, he may open fire without provocation. In the two-minute video below, a motorist hits a road median and flips his SUV on its side, accidentally killing his young wife. As the dazed and UNARMED motorist climbs out of the wreck, a policeman needlessly fires two shots at him, hitting the motorist in the neck and paralyzing him. The policeman faced no charges. In the video below, police shoot Nicholas Robertson, 28 (a married father of three). As Robertson struggles to crawl away on the ground, the police fire 33 shots, killing him. The police claimed that Robertson had a gun. Welcome to the United States of Violence. you argument is weakened, considerably, when you include Nicholas Robertson. surely you could have found a more deserving cop killed individual, one that wasn’t waving around a gun, firing off shots in the air, and etc., etc……..
A perfect storm of hysteria and anti-government sentiments will lead to…what, exactly? Got it? Because of fear mongering and lies, terrorism now is more important than the economy, guns or the government. That is how crazed the right wing has made the public. This verifies my contention that guns are necessary to maintaining the Gap between the rich and the rest in the USA. As for Trump, he has now been endorsed by the Policeman’s Malevolent Association, “the fastest-growing law enforcement organization in the northeastern United States” (according to the NEPBA’s website). The NEPB represents some 5,000 cops from Massachusetts to the crucial primary state of New Hampshire. Thus, one of the largest policeman’s unions in New England supports Trump’s call to deport all Muslims and refugees, including economic refugees (e.g. undocumented Latin Americans). This means that an organization authorized to pull people out of cars and use deadly force supports a blatant bigot. Trump is also the darling of washed-up has-beens, such as Hulk Hogan, Mike Tyson, Dennis Rodman, Mike Ditka, Lou Ferrigno, and America itself. It’s cowardice, pure and simple, from your elected representatives. Bush called John Howard a “man of steel” Well, compared to those in Congress he most certainly was courageous. That courage or lack of is what stands out. Refugees are created by the hate and selfishness of many politicians. Meanwhile the masses (in their own hate) condemn the refugees. Rodger, I don’t know what to make of this. What do you think? The federal funds rate is used to set terms for many consumer and business loans. The interest rate has been near zero since 2008. Many people think the Fed will raise the federal funds rate tomorrow (16 Dec 2015). Some “progressive” economists say that a rate increase will slow the economy, and will hurt ordinary people, especially job seekers (since cash-squeezed companies will hire fewer workers). They say the Fed funds rate should only be raised when there is a genuine problem with inflation, which we do not have. I mention this because you seem to say that these economists are looking at the wrong thing. They are looking at interest rates, when they should be looking at the shrinking deficit. Whether an interest rate increase helps or hurts average people depends on the size of the federal deficit. Low interest rates cause savings accounts to pay near zero interest. Therefore low interest rates eat away at savings, especially when the consumer price index is higher than the interest rate paid by banks into ordinary bank accounts. Low interest rates also force pension funds and fragile banks to take dangerous risks. Low interest rates are not “stimulative,” since they slow the rate that the U.S. government pumps new money into the economy. For example, low interest rates mean that Treasury securities collectively pay billions of fewer dollars in interest. Moreover the Fed itself buys mass quantities of T-securities, in order to keep T-security interest rates lower than what markets would otherwise pay. Therefore low interest rates reduce the federal deficit, which causes recessions. When the Fed, under Chairman Greenspan, instituted numerous rate cuts, the result was a recession, which was cured by Bush’s war spending, and especially Bush’s tax cuts. Low interest rates do not stimulate the economy. High interest rates stimulate the economy slightly, if only because T-securities pay more. But what REALLY stimulates the economy is a large federal deficit. Politicians reduce the deficit in order to sustain recessions, which in turn widen the Gap between the rich and the rest. Low interest rates are the federal government’s method for reducing the federal deficit without the political danger of raising taxes, or cutting things like Social Security benefits. Low interest rates hurt the rich, but they hurt the poor much more, because the poor suffer from the recession, and from reduced interest income in their bank accounts. The rich are happy to see their income reduced so long as the Gap is increased. If low interest rates do not help average people, then do high interest rates help average people? No. THE KEY IS THE FEDERAL DEFICIT. If the federal deficit is too small (as it is now) then low interest rates do not help average people. Nor do high interest rates, since people must make higher payments on mortgages, car loans, payday loans, and so on (although average people’s bank accounts might pay a bit more in interest). Moreover, loan dollars are “temporary” dollars, which disappear when the loans are repaid. Only the U.S. government creates long-term dollars, which disappear when they are taxed. And only long-term dollars can genuinely grow the U.S. economy. Therefore, what most hurts average people are not interest rates (high or low) but a shrinking federal deficit. Have I interpreted you correctly? If so, them it seems to me that – given the shrinking deficit — the “progressive” economists are correct in saying that an increase in the Fed funds rate will hurt average people. Is this another Fed attack on us? The Fed lowered interest rates in order to help reduce the deficit. Now that the deficit is tiny, does the Fed want to nail us again, this time with higher interest rates? Or does the Fed actually want to help us? You once suggested that an optimum benchmark interest rate would perhaps be one percent above the inflation rate. Honestly I’m confused. What do you think? Right now, with a federal deficit that is far too small, would an increase in the Fed funds rate help us, hurt us, or make little difference to us, good or bad? Deficit spending grows the economy by adding dollars to the economy (GDP=Federal Spending + Non-federal Spending + Net Exports), and because most deficit spending is social spending, deficit spending helps narrow the Gap. Raising interest rates also adds dollars to the economy (a relatively small number), because higher rates force the federal government to pay more interest on T-securities. Therefore, higher rates are slightly stimulative. The major effect of higher rates is to strengthen the dollar, meaning higher rates fight inflation. Bottom line: Congress and the President are mostly responsible for economic growth (or lack of it). The Fed controls inflation. Despite popular wisdom, raising rates is not the big worry the Fed wants you to believe it is. The Fed takes way too much credit and way too much blame for the economy. The stock market gyrations in advance of potential rate hikes, merely demonstrate the difference between the stock market and the economy. Ban all guns except for colonial hunting muskets…this maintains the constitutionality of the measure and pleases the hunters. Impose mandatory sentencing for banned gun possession–strict liability prison time of 5 years. Possess a gun during the commission of a crime? 10 years. Shoot someone? 20 years. Kill someone? Life without parole. This solution, and I’m all about solutions, will dry up the availability of these tools of destruction which will frustrate the potential lunatic mass shooter from acquiring a gun in the first place. And just what the hell is a gun nut on a shooting rampage going to do with a musket? Not much. Kneecap the gun mafia with this mandatory sentencing guideline. Here are some other thoughts for you to ponder before you keep on with the typical gun grabber ideas. BTW, I believe other levels of crime have increased in Australia since the big gun grab. Gee, I wonder why. “America doesn’t really have a significantly higher rate of crime compared to similar countries. “But that crime is much likelier to be lethal: American criminals just kill more people than do their counterparts in other developed countries. “And guns appear to be a big part of what makes this difference. Only the tiniest fraction of victims of violent crime are able to use a gun in their defense. Over the period from 2007-2011, when roughly six million nonfatal violent crimes occurred each year, data from the National Crime Victimization Survey show that the victim did not defend with a gun in 99.2% of these incidents—this in a country with 300 million guns in civilian hands. And this doesn’t count innocent victims caught in the crossfire. Hey, if you love guns, no facts will influence you. The above post was not written for gun nuts; it was written for people who actually want to know the facts.